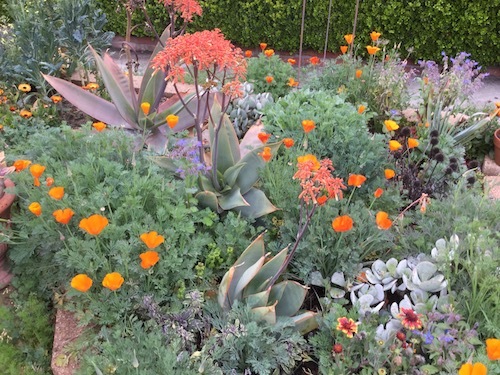 Instead of "drought tolerant" I've adopted "climate appropriate" into my gardening vocabulary. 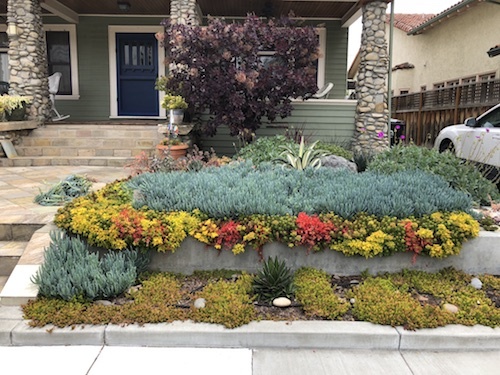 Designing gardens that meet our needs in urban California involves a lot more than just saving on water use. When I'm designing a garden I always aim to create a visually richer, as well as more earth-friendly environment than what I started with. The word appropriate aligns especially well to our changing climate and growing conditions: this is the challenge we all face today and for the foreseeable future. And to me it implies that my climate appropriate approach to designing a garden, will adapt to meet the current needs. It's a good reminder to be flexible in my thinking, and to keep informed. Among many inspirations, landscape architect Thomas Rainer stands out. He champions the cause for bringing more "wildness" into our urban spaces, urgently needed due to the rapid loss of wild spaces. See Rainer in this short video interview here (courtesy of the Pacific Horticulture Society). We have the perfect opportunity to add ecological value whenever we are replacing lawns or simply replacing and/or adding plants to our gardens. For example, plant flowering shrubs for your eyes and to feed pollinators- the gorgeous sage (salvia) below is 'Friendship Sage', also known by its original name 'Saliva Amistad'. Hummingbirds love sages, as do bumblebees. 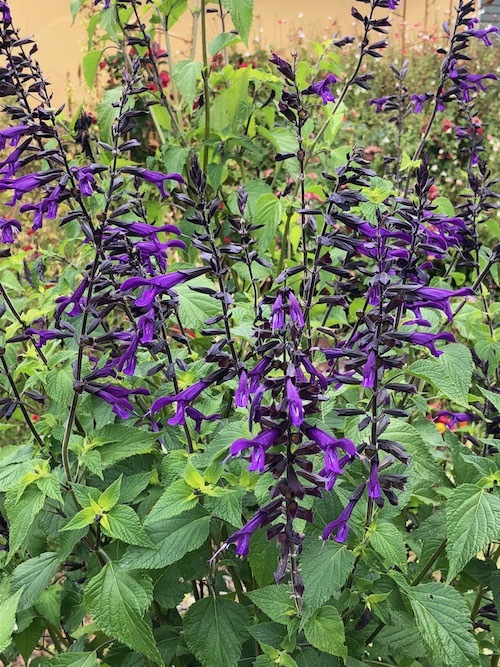 This group of plants are generally happy with low to moderate water, even in warm climate zones such as our San Francisco Bay Area. In the photo below we designed a long berm with a mix of sages and other flowering plants to create a pollinator garden that would be pleasant to look at from the outdoor patio and from inside the house. 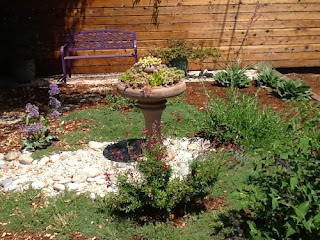 We included an herb garden for fragrance and its value in providing herbs for cooking year-round. When replacing pools, lawns, or areas that were previously paved over, I love creating a space that enhances quality of life by being a place to relax and connect with nature. And it's a welcome bonus that adding more plants around homes results in not only beautiful, calming, environments but they mitigate the amount of heat produced by our over-paved urban spaces. Plants transpire water vapor into the local environment, especially trees. So not only do trees provide shade, they actively contribute to cooling. 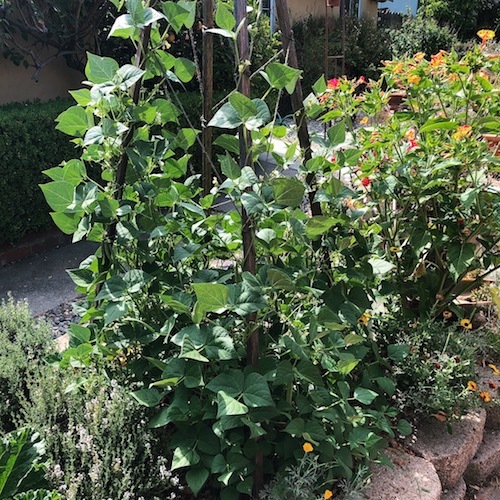 In California where the loss of trees due to drought and fires is staggering, we can do our part by planting trees with low and moderate water needs around our homes, as many as possible. 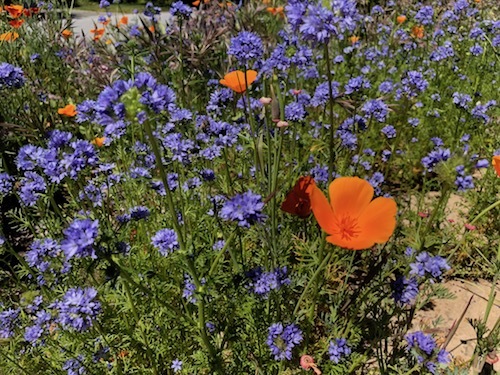 Below, wildflowers in a front yard meadow garden provide a spectacular seasonal display. 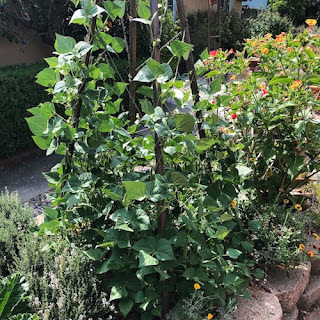 I'm also a big fan of growing seasonal edibles at home, and when we save water by replacing lawns or pools with a low water garden, we can feel good about using some water on our special heirloom vegetables. Growing our own food not only connects us to the seasons but can also remind us of our heritage and culture. Heirloom vegetable seeds are readily available from many sources. It's meaningful and satisfying to learn their stories and enjoy them with our families and friends by growing them. Many fruit trees are perfect for low to moderate water gardens: avocado, plum, pluot, apple, persimmon, pomegranate and pineapple guava. Check my gardening index for more on edible landscaping. For more information and resources about climate appropriate landscaping go here.